We are engaged in exporting and supplying excellent quality Electric Warp Beam High Lift Trolley for Upper Beams to our valuable clients. ST-MBT-04 Electric Powered Beam Brolley is suitable for upper beam transporting, inserting in weaving machines. The removal of batches from the winder; The loading of warp beam storage racks and batch storage racks; The mounting of sectional beams in knitting machines as well as the handling of non-woven material rolls. Polyurethane running wheels mounted one after the other in an oscillating manner lead to low ground contact pressure with high stability. Telescopic supporting rollers with safety control ensure a safe operation. 1)Regular drive with 2-AC drive motors. 3)Electronic pulse steering for smooth starting and braking. 4)Automatically extending support rollers for transverse movement. 5)Lifting movement by motor-driven with automatic quick lift. 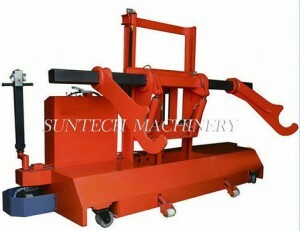 Suntech is leading supplier of beam trolley, cloth roll storage, automatic beam storage as well as batching motion. Our Basic Stretch Wrapper is ideal for low volume applications. This operator controlled stretch wrapper has a load capacity of 3000 pounds, is simple to operate but perfect for those little loads that require Stretch Wrap Film containment. The operator controllers the up/down carriage travel to apply the Machine Stretch Film to the load and like our other Semi Automatic Stretch Wrappers, the PUP control panel gives the operator the ability to raise or lower the carriage and control the speed of the turntable. If your production line has heavier loads but a low volume, take a look at our Manual Stretch Wrapper or any of our other Semi Automatic Stretch Wrappers, and take advantage of our offer to receive 10% off you first order of Stretch Wrap Film when you order any of our Stretch Wrappers. Stretch wrapping is the most economical way of Roll packing. 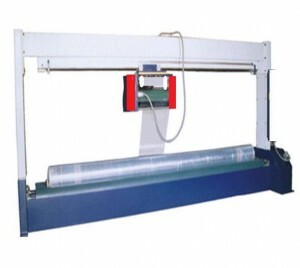 The Fabric Roll Stretch Wrapping Machine is used to pack rolls of many items like denim fabric, carpets, curtain cloth, paper, film etc. Stretch Wrapping Machine offers the most profitable way to pack your valuable goods by saving in cost of film, labour and power. Our machines are from the leaders in stretch wrapping and are in use at various industries all over India and Abroad. • Suitable for packing any rolls of Denim Cloth, Curtain Cloth, Carpets, Foam sheets, Upholsteries, Fabrics, Film, Paper etc. It is a real fact that for all those weaving industries where the production is huge, handling Cloth Rolls for local transportation or for exports, without affecting their Quality, will always be a problem, unless & until the above machine is introduced. This machine is ideally suitable for large weaving mills manufacturing heavier and wider-width cloth rolls like Denim Fabrics, Carpets, Upholsteries, where cloth in Roll-Forms are to be protected from dust & moisture when in storage and in subsequent transportation. The automated operation cycle can be programmed and monitored through microprocessor interface. This machine saves huge labour costs as well as packing time apart from convenience while loading trucks / containers when dispatched from mills. Changing over from Shrink wrapping to this type of Stretch Wrapping, gives huge amount of savings in power costs, and hence its cost of investment is paid back within ‘few months’. It is easy to operate & very simple to maintain; it is sturdy & user friendly; it can accommodate even wider width – bigger diameter fabric rolls & stretch wrap them quickly. This machine is using 220 V, 1-phase, 15 Amps, & 1.5 kW power supply. With power pre-stretch film carriage, ET300PPS pallet wrapper realizes minimum film consumption, this allows you save material cost and return on your investment soon. We provides semi and fully automatic stretch wrapping equipment in several configurations, able to wrap practically anything. Our pallet stretch wrappers can wrap both stable and unstable pallet loads at speeds of up to 30 RPM. Our stretch wrapping equipment is capable of running a wide variety of sizes, and handle all standard stretch film widths. With load capacities ranging from 3,000 lbs. to unlimited weight, you are sure to find the right system to fit your needs. 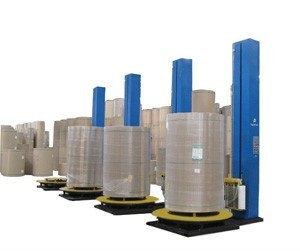 Pallet stretch wrappers are available in a variety of styles including platform, rotary and orbital. 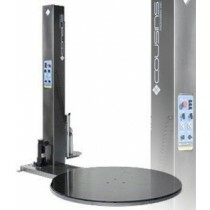 Through our unique WRAP-N-WEIGH® option, wrapping and weighing are combined into one operation by integrating a precision scale and digital controls with either high or low profile turntables. This brings greater economy and efficiency to any wrapping operation that requires weighing. Our systems also feature the Rockwell Allen-Bradley control platform. We has standard models in stock for quick shipment, yet specializes in the design and development of custom machinery. We will apply our industry expertise, which includes 30,000 installations, to create pallet stretch wrapping equipment tailored to your exact needs. Stretch wrapping equipment is widely used to wrap pallets and horizontal loads in the household care, construction, food, beverage, and personal care industries. We have deep experience developing stretch wrappers for countless products including metal bars, re-bars, lumber, molding, rolls and carpet. Other items typically wrapped include bottles, jars, cans, cartons and more. Straight Knife Cloth Cutting Machine with Automatic Abrasive Belts Sharpener, it is the most popular cutting machine in the Garment Industry. 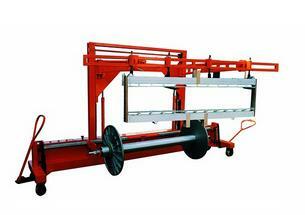 Its suitable for cutting all kinds of fabrics from thin materials to thick materials. MOTOR The motor is an originally developed motor. 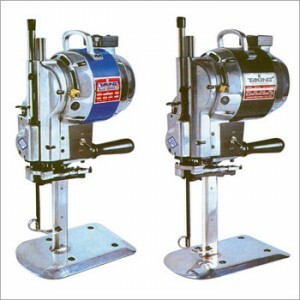 It assures a smooth cutting operation with excellent cutting power and low motor temperature. AUTOMATIC OIL LUBRICATION DEVICE: Oil can be supplied automatically from oil reservoir to the guide metals and cross head. And the internal oil guard keeps other interior parts clean. AUTOMATIC SHARPENING DEVICE: There is an abrasive belt sharpening device. Just press down the sharpening lever, and the blade can be sharpened automatically to maintain the most suitable edge of the blade. STANDARD: Thinner and flat type Standard makes the resistance of cutting material lower, and bigger blade stroke makes cutting smoothly. BASE PLATE: The base plate is low and the surface is smooth to make the material travel on it smoothly before and after cutting. OTHER: Fan-guard and Starting switch cover are equipped for safety reason.